← UFO’s Show Up Followed by Aircraft. 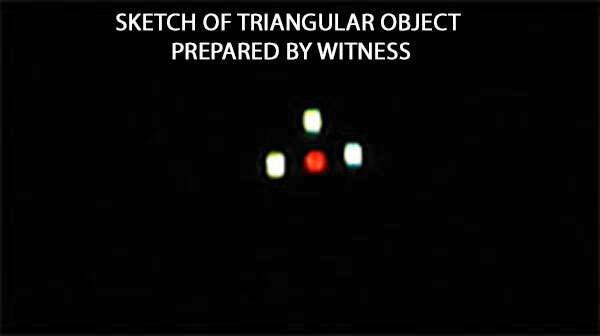 SKETCH OF TRIANGULAR OBJECT PREPARED BY WITNESS. Description: A friend and I were standing outside and I pointed out a weird object in the sky low enough to make out. The craft was perfectly triangular shaped and had three white circular lights that blinked with a red one in the center. The craft looked dark like it was black. We witnessed it and then it quickly vanished. But the weird thing about the object, is that it didn’t make a single sound when it flew by us. This entry was posted in black, silent, Sketch, Triangular Craft, UFO Sightings 2019, UFO Sightings Ohio, Unidentified and tagged Red lights, White lights. Bookmark the permalink.